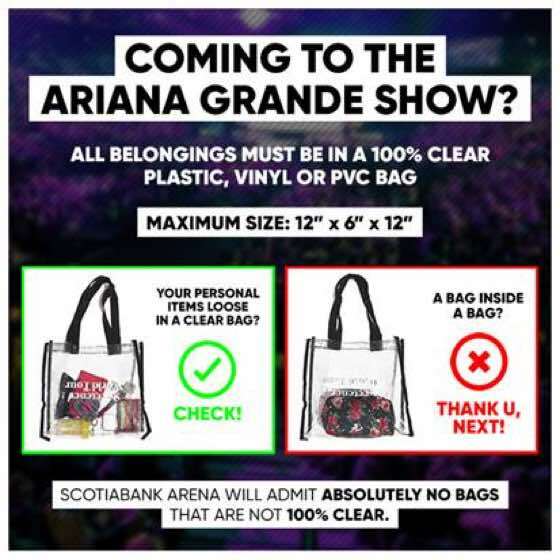 Ariana Grande arrives in Toronto tomorrow night (April 3) for the first of two visits in the city this year, but if you want to get into the show, you'll have to comply with a stricter-than-usual bag policy. The venue has (totally understandably) adopted a temporary change in bag restrictions for the upcoming concert, which will allow attendees to bring just one clear bag. All bags must be "100 percent clear/transparent" and made of clear plastic, vinyl or PVC. They cannot exceed the dimensions of 12 inches by 6 inches by 12 inches. All items in the bag must be loose — so don't try to bundle personal items inside of other smaller bags before placing them in the clear bag. Finally, if fans have medically necessary items that don't fit inside the prescribed bag requirements, they will be permitted only after a thorough inspection. If you weren't able to get your hands on some of Grande's Sweetener-branded see-through merch, a one-gallon Ziploc bag (or similar) is a totally acceptable alternative. The show starts at 8 p.m. tomorrow evening and features supporting sets by Normani and Social House. Grande will make an additional stop in Toronto on June 26. See her remaining "Sweetener World Tour" dates here.